Foldercultures utilises the visual elements of the computer desktop in a transmedia combination of digital-video projection, sculptural form and rapid-prototyping (3D printing). Foldercultures (2010) continues a body of work which investigates the potential for revisualising the computer graphical user interface across the differing formats of digital space and out into material culture. The work explores the metaphor of the desktop folder – through notions of scale, composition, functionality and form, cross-referencing the materialisation of a computer icon into projected and material space. 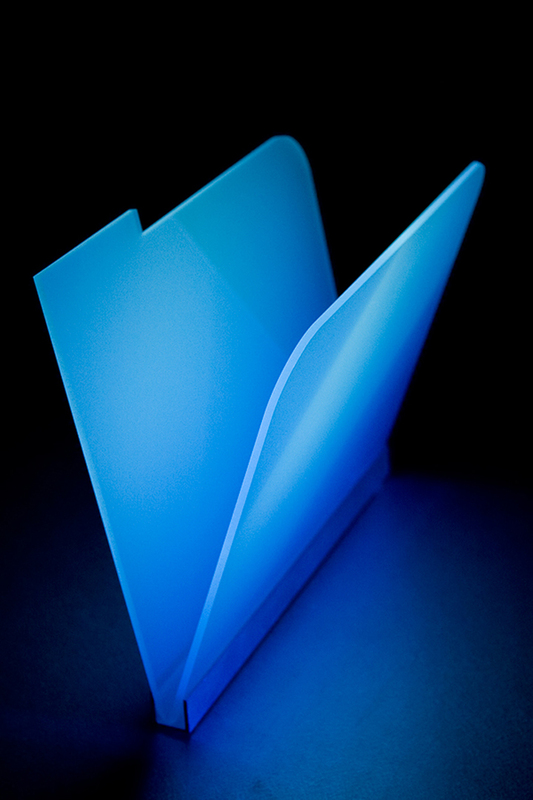 In the work the digital image of the desktop folder is projected onto an acrylic model of a physical version of a desktop folder, refolding the image back onto itself across media forms. This transformation is further emphasised through the use of semi-transparent acrylic, which allows the projected image to revisulise on all sides and faces of the model. Weaving together qualities of both interface and material culture, the work creates a special experience, and interface that sits between the computer and physical space. These visual laminates contribute to the acceptance of the digital form as a point of social convergence and a shared technologised visual language.